Most gummy vitamins contain most nutrients found in typical vitamins. Because they do contain some amount of nutrients, taking gummy vitamins as a supplement can be an effective way to supplement vitamins and minerals. However, gummy vitamins may not be the most effective way for adults to supplement their micronutrients due to complications such as minimal regulation, misleading labels, and lower nutrient concentrations. Recent steps have been taken to ensure that safety of supplements, such as the Food Safety Modernization Act (FSMA) and the extension of Current Good Manufacturing Processes (CGMP). However, supplements remain problematic as they are loosely regulated by the FDA. Currently, it is not required for producers to prove their supplement's safety before introducing them to the marketplace. Gummy vitamins are at the epicenter of this problem as many do not participate in third party lab testing to ensure quality. Gummy vitamins with a USP or NSF seal have been tested for quality and are the safest to consume. 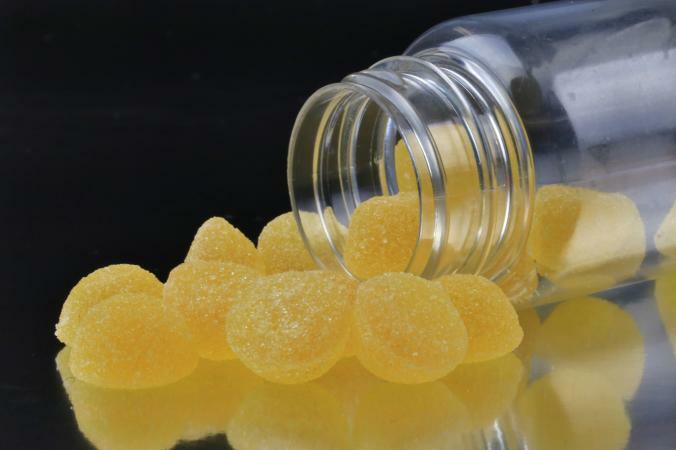 Vitamin gummies are more difficult to manufacture than pills or tablets. For that reason, the label does not always reflect what is found inside the gummy vitamin. In one instance, a leading third party testing lab known as ConsumerLab tested five gummy vitamins for quality, and four of the five supplements failed testing. These products either contained less or more nutrients than the amount listed on the label. Additionally ConsumerLab found some of the failed gummies exceeded the Institute of Medicines's upper tolerable intake levels (ULs) niacin, vitamin A, folate, or magnesium. In a statement, ConsumerLab reported gummy vitamins, "do not contain their listed amounts of vitamins or minerals, or contain impurities." The testing lab stated they find a greater amount of problems with gummies than with traditional forms of supplements, such as tablets and caplets. If supplements do not contain the nutrients listed on the label, this impairs how effective they are, renders them pointless, and may make them risky for consumers to take. Expert dietitians claim the concentration of nutrients found in gummy vitamins is lower than the concentrations found in tablets. They explain the reason for this is that other ingredients need to be packed into the gummies, such as flavoring, coloring, and sugar, leaving less room for vitamins and minerals. While gummy vitamins are effective for adults as they still contain some nutrients, they are not as effective as other, more concentrated forms of supplements. When comparing a commonplace gummy vitamin, such as Vitafusion Multivites, to a household multivitamin tablet such as Centrum Specialist Adult Multivitamins, both supplements offer nutrients the other does not. The biggest difference between a tablet multivitamin and gummy vitamin is that the gummy vitamin contains sugar and calories. These are small amounts, but still present. Additionally, it is evident from the chart above that one multivitamin tablet is more concentrated in vitamins and minerals than a serving of two gummies. Gummy vitamins do contain some amount of nutrients and therefore can be effective to supplement as a multivitamin. However, when taking into account lessened nutrient concentrations, unreliable ingredient lists, and other added ingredients, gummy vitamins are nowhere near as effective as traditional pills and tablets to supplement vitamins and may even be unsafe at times. Pills and tablets are more reliable and concentrated, making them the safer, more effective vitamin choice.